These are just the soaps we have been looking for! We have sensitive, allergenic skin and could not find a natural, non-irritating soap locally. So we decided to use our excess goat milk to make our own. Lots of lathery suds, gentle on our sensitive skin & free of the bad stuff. We hope you enjoy them as much as we do! Free of artificial colors, fragrances (unless noted*), preservatives, petroleum & chemicals. 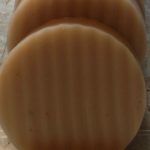 We have a few soap recipes that incorporate an essential oil & fragrance blend of quality scents. These will be noted (*) for those with sensitive skin. We are always working on new soaps for our recipe box. • Moisturizing and has a natural, light nutty smell of shea butter leaving a mild, fresh scent. • Leaves a mild, clean scent guys even love! • Great for irritated skin and face. • A bright blend scent of gingery green with the benefit of antioxidants for the skin. • Great for removing garage grease, strong smells, and garden dirt without stripping the natural oils from the hands. • A light scent of lavender with dried rose petals. 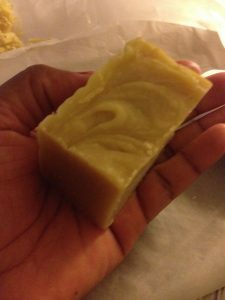 Ingredients: organic coconut oil, African shea butter, whole goats milk, distilled water, lavender essential oil, dried rose petals, naturally occurring glycerin by saponification (lye soap making process). • Soothing and leaves a mild, clean scent and oats to gently exfoliate and sooth sensitive skin.Great for soothing poison ivy. • A basic, get-it-clean bath bar. • A touch of peppermint to perk up the senses. • Added oats we find are nice for gently exfoliating and soothing our sensitive skin. • A wonderful, floral scent of Palmarosa, Lavender & Ylang Ylang to perk the senses! • A basic body bar that leaves a mild, clean scent. • A light, floral scent of wisteria buds with lots of lather & silky soft for moisturizing the skin. • A light, hint of earthy floral scents with a silky lather for soft, moisturized skin. Ingredients: organic coconut oil, whole goats milk, castor oil, aloe vera, naturally occurring glycerin by saponification (lye soap making process), Honeysuckle jasmine essential oil.